Proposed Borough Hall Skyscraper Historic District. Image: Courtesy of LPC. Elected officials and business community expressed concerns about proposed twenty-building district. 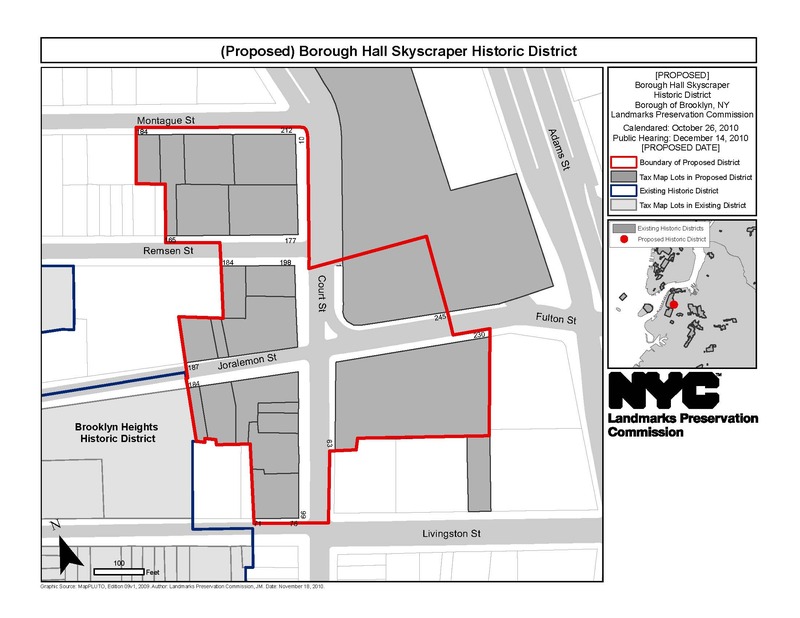 On December 14, 2010, Landmarks heard testimony on the proposed Borough Hall Skyscraper Historic District in downtown Brooklyn. The district would include approximately twenty properties along Court, Montague, Remsen, Joralemon, and Livingston Streets. The proposed district is characterized by large commercial buildings in a range of architectural styles including the 35-story Montague-Court Building at 16 Court Street, the 32-story Brooklyn Chamber of Commerce Building at 75 Livingston Street, and the thirteen-story Temple Bar Building at 44 Court Street. Many of the buildings were constructed in the late 19th and early 20th centuries following New York City’s consolidation and at a time when speculators believed downtown Brooklyn would become a financial and commercial center to rival lower Manhattan. Landmarks calendared the proposed district in October 2010. At a hearing, Brooklyn Borough President Marty Markowitz spoke in support stating that the district was a “monument to the borough’s history.” Markowitz, however, asked Landmarks to exclude 75 Livingston Street, which is now a residential co-op, from the district. He said the tenants opposed designation because it would add onerous fees and complicate a planned renovation. Representatives of Assembly Member Joan Millman and local Council Member Steven Levin also recommended that Landmarks exclude 75 Livingston Street. Several residents of the co-op attended the hearing also to speak against including their building in the proposed district. Seth Taylor, representing the Court-Livingston-Schermerhorn Business Improvement District, opposed designation citing the district’s limited architectural merit, the potential negative economic impact on the area, and the “unfair burden” of higher costs in maintaining residential buildings. Brooklyn Law School’s president, Joan Wexler, argued that a “district approach” was inappropriate for an area she characterized as being a “disparate collection of buildings.” Wexler claimed that the inclusion of the law school’s residence hall at 184 Joralemon Street would raise costs for the school and ultimately for students. Representatives from the New York Landmarks Conservancy, the Municipal Art Society, and the Historic Districts Council all spoke in support of designating the proposed district in its entirety. The Historic Districts Council’s Simeon Bankoff pointed out that the district would be the first “principally commercial district” created outside of Manhattan and said the business district’s failure to thrive as a financial center did not diminish its architectural or historic value. Brooklyn Community Board 2 supported designating the district as proposed. The hearing was closed, and Landmarks has not set a date to vote on the proposed district. LPC: Borough Hall Skyscraper Historic District, Brooklyn (LP-2427) (Dec. 14, 2010). CityLand Comment: Comment: On January 7, 2011, the Wall Street Journal reported that Brooklyn Law School had signed a contract to sell its residence hall at 184 Joralemon Street to a private developer that intends to convert it into condominiums.